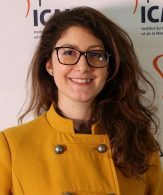 Sara Baldassari joined the team Genetic and physiopathology of familial epilepsies in the Brain and Spine Institute in June 2017, where she will contribute to the understanding of the neurodevelopmental role of genes implicated in focal epilepsy, especially focusing on mTOR pathway. Somatic mutations in focal cortical dysplasy. Baldassari S, Licchetta L, Tinuper P, Bisulli F, Pippucci T. GATOR1 complex: the common genetic actor in focal epilepsies. J Med Genet. 2016 May 19. pii: jmedgenet-2016-103883. Licchetta L, Pippucci T, Bisulli F, Cantalupo G, Magini P, Alvisi L, Baldassari S, Martinelli P, Naldi I, Vanni N, Liguori R, Seri M, Tinuper P. A novel pedigree with familial cortical myoclonic tremor and epilepsy (FCMTE): clinical characterization, refinement of the FCMTE2 locus, and confirmation of a founder haplotype. Epilepsia. 2013 Jul;54(7):1298-306. Bisulli F, Naldi I, Baldassari S, Magini P, Licchetta L, Castegnaro G, Fabbri M, Stipa C, Ferrari, S, Seri M, Goncalves Silva GE, Tinuper P, Pippucci T. Autosomal dominant partial epilepsy with auditory features: Anew locus on chromosome 19q13.11-q13.31. Epilepsia. 2014 Mar 1. Magini P, Bisulli F, Baldassari S, Stipa C, Naldi I, Licchetta L, Menghi V, Tinuper P, Seri M, Pippucci T. LGI1 microdeletions are not a frequent cause of partial epilepsy with auditory features (PEAF). Epilepsy Res. 2014 Mar 26. pii:S0920-1211(14)00079-5. Ricos MG, Hodgson BL, Pippucci T, Saidin A, Sze Ong Y, Heron SE, Licchetta L, Bisulli F, Bayly MA, Hughes J, Baldassari S, Palombo F; Epilepsy Electroclinical Study Group, Santucci M, Meletti S, Berkovic SF, Rubboli G, Thomas PQ, Scheffer IE, Tinuper P, Geoghegan J, Schreiber AW, Dibbens LM. Mutations in the mTOR pathway regulators NPRL2 and NPRL3 cause focal epilepsy. Ann Neurol. 2015 Oct 27. Hildebrand MS, Tankard R, Gazina EV, Damiano JA, Lawrence KM, Dahl HH, Regan BM, Shearer AE, Smith RJ, Marini C, Guerrini R, Labate A, Gambardella A, Tinuper P, Lichetta L, Baldassari S, Bisulli F, Pippucci T, Scheffer IE, Reid CA, Petrou S, Bahlo M, Berkovic SF. PRIMA1 mutation: a new cause of nocturnal frontal lobe epilepsy. Ann Clin Transl Neurol. 2015 Aug;2(8):821-30. Bisulli F, Licchetta L, Baldassari S, Pippucci T, Tinuper P. DEPDC5 mutations in epilepsy with auditory features. Epilepsia. 2016 Feb;57(2):335. Neri I, Virdi A, Tortora G, Baldassari S, Seri M, Patrizi A. Novel p.Glu519Gln missense mutation in ST14 in a patient with ichthyosis, follicular atrophoderma and hypotrichosis and review of the literature. J Dermatol Sci. 2016 Jan;81(1):63-6. Henden L, Freytag S, Afawi Z, Baldassari S, Berkovic SF, Bisulli F, Canafoglia L, Casari G, Crompton DE, Depienne C, Gecz J, Guerrini R, Helbig I, Hirsch E, Keren B, Klein KM, Labauge P, LeGuern E, Licchetta L, Mei D, Nava C, Pippucci T, Rudolf G, Scheffer IE, Striano P, Tinuper P, Zara F, Corbett M, Bahlo M. Identity by descent fine mapping of familial adult myoclonus epilepsy (FAME) to 2p11.2-2q11.2. Hum Genet. 2016 Jul 1.